I can honestly say I am surprised that I loved this book. I thought the last two Rhyme books were seriously off and I didn’t even know if I could continue with this one, but I did. Glad I bought it. We have Rhyme and Sachs investigating a case in which a murderer has someone escaped from what appears to be a locked room. The more they investigate, the more they find themselves embroiled in the world of magic and illusion. 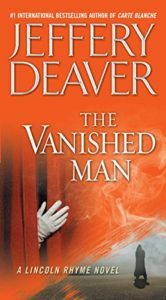 I got a kick out of this book since Deaver sprinkles little gems throughout regarding some famous tricks and illusions. I also loved how those into this use a variety of methods to trick an audience’s senses. The love between Ryhme and Sachs makes more sense in this one. Thank goodness. I really didn’t get what was going on between the two of them in the last two books and wondered how the heck they even worked together. What really works this time through is that we get to see a stronger and more confident Sachs. We have Sachs testing for the sergeant’s exam and it looks like she has a promotion in her sights. Rhyme is still his sarcastic self and ready to rush out and feel injured on perceived slights. However, this one made him more human to me due to an introduction of a secondary character named Kara. I love the characters we have grown to know through the series like Lon and others. But with the introduction of the character Kara I finally found someone that I hope pops up in future books. We also per usual have a POV starring the bad guy and I wish that Deaver would stop that. These books feel so full and I wish he either cut the number of characters we track, or just leave out the bad guy’s justification. Also the final final reveal of the bad guy didn’t work for me at all. It was way too out there to be believed. But I felt that way about most of the bad guys in these books except for The Bone Collector. The writing was great. There is a lot of historical information and detail included in this book. I can say that for once I didn’t feel overwhelmed on how the science was presented to me either. Deaver did a better job of including the science talk in dialogue with characters. The flow was off throughout though. I think that’s because of the multiple red Herrings we get in this book. At one point I maybe said please just let it end. But the book kept going and going. The big case that Rhyme and Sachs investigating ties into an active case dealing with a white supremacist movement so that was gross to read about it considering what is going on in the US right now. It seems like lately a lot of my books are apt due to current political shennigans. The ending though leaves things changed in Sachs professional life. I wonder how that is going to impact her continuing work with Rhyme. Share the post "Now You See Him…."